L'Wren Scott fragrance and perfume list. L'Wren Scott fragrances: L'Wren Scott is an American fashion designer. 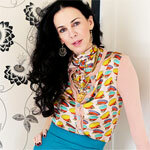 L'Wren Scott is an American fashion designer. The Utah native started modeling at the age of 17, and has recently been linked romantically to Mick Jagger. Her signature fragrance was launched in December 2012.